​WASHINGTON (AP) — A basketball enthusiast, President Barack Obama applauded the Golden State Warriors on Thursday and marveled at how they are revolutionizing professional basketball with what he described as a "small-ball nuclear lineup" that specializes in great shooting and passing. The Warriors defeated the Cleveland Cavaliers in last year's NBA finals and are off to a historically strong start in their quest to repeat, sporting a 45-4 record so far this season. "It's beautiful to watch when they're working on all cylinders," Obama said during a ceremony at the White House. Obama, a big Chicago Bulls fan, couldn't help but reference the great Bulls teams from the 1990s. He jokingly told the Warriors at the beginning of the ceremony that it's rare to be in the presence of guys who are part of one of the greatest teams in NBA history. "So we're pretty lucky today that we've got one of those players in the house - Steve Kerr," Obama said, referring to the Warriors coach, who also played on those Bulls teams. The Warriors are led by Stephen Curry, a sharpshooting guard who won the NBA's Most Valuable Player award last year. Obama tried to mimic some of Curry's jumping up and down on the court when he's playing particularly well, which Curry did on several occasions the night before, when he scored 51 points in a win over the Washington Wizards. "He was clowning," Obama said. The team presented Obama with the obligatory No. 44 team jersey, since he is the nation's 44th president. Kerr noted that Obama would be a free agent at the end of the year. 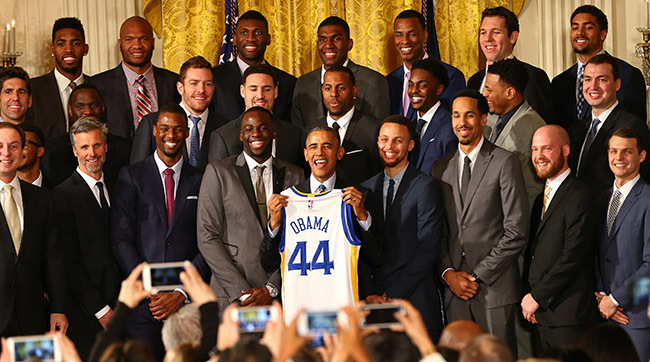 "Consider this a symbol of an offer that's coming," Kerr said as he presented Obama with the jersey and the president demonstrated his shooting form.